Debt Free immediately and permanently have financial peace of mind before bedtime tonight. End the nightmare of debt. Your current situation is unbearable. What you are supposed to repay on your debt does not allow you to live a life or even feed your family properly. You pay your debt on a hit and miss basis and eventually have more misses than hits. Your situation is spiraling into a never ending financial nightmare. Debt counseling still requires you to repay your debt (all your debt) and the interest on the debt continues to grow. 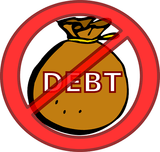 In many cases clients do not have the ability to qualify or maintain the arrangement they have with the debt review process and in all cases any debt that has attracted a legal proceeding is excluded which still allows for additional garnishee orders and repossession of your goods. This is a commitment to you and your family’s future not a quick fix. Curator fees are payable over 19 months – this is used to settle the creditors who stake claims at the Curator. After full payment of the fee of R 8000, you will receive an Introduction letter from Attorney, with all their contact details on. Remember you do not pay ANY creditors only the process and on a PAYMENT plan – so you have the money!